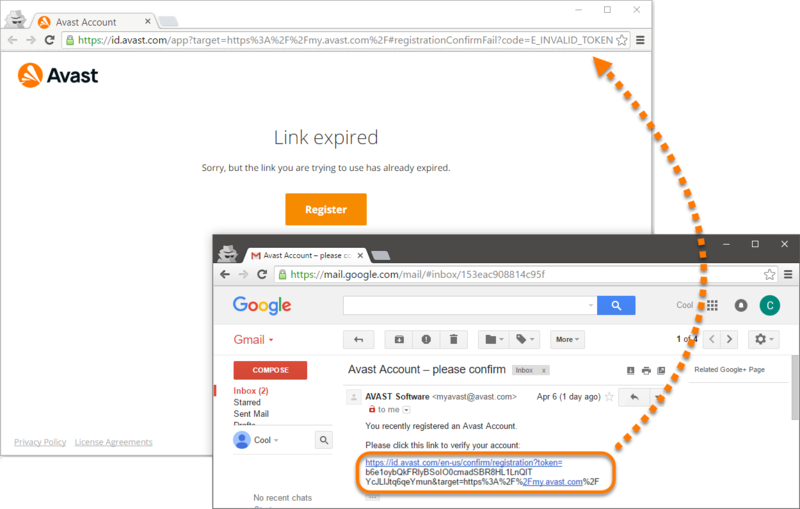 When you register or create a new Avast Account, you receive an activation email containing a link to verify your account. Depending on your email provider, this link can sometimes be broken in the activation email that you receive, causing the activation to not work properly. A broken link occurs when the formatting mechanism of your email provider causes the original link to split onto separate lines and no longer read as one hyperlink when clicked. Copy and paste the entire link from your activation email directly into a browser navigation bar. While holding the left mouse button, drag the cursor until the entire link is highlighted, then release the left mouse button. Press the Ctrl and C keys simultaneously to copy the link, or alternatively right-click the highlighted link and select Copy from the context menu. Click into the browser navigation bar and press the Ctrl and V keys simultaneously to paste the link, or alternatively right-click in the browser navigation bar and select Paste from the context menu. Ensure that the final link pasted into your browser navigation bar begins with https, has no extra spaces or characters, and is not missing any characters. If copying and pasting the entire link does not work, copy and paste each line separately. Press Enter to verify your account. Once verified, you are directed to my.avast.com where the completion of your registration is confirmed. You can now use the Login button to log into your new Avast Account.